Hialeah Gardens Movers – Moving is one of the most difficult and stressful events that people have to deal with. Our team strives to remove the stress and tension from your move. 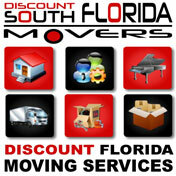 Discount South Florida Movers has been serving the Miami area for over fifteen years. Our experience and professionalism will guarantee that you will be satisfied with your move and all at the best rate you can find in the anywhere. We offer assistance in many areas of moving. We can safely and securely pack your belongs, arrange long distance transport, and even move specialty items like pianos. Do you need to have your move done at night or on the weekend? We do that for you free of charge. If you need to move your office or your residence, there’s no better choice than Discount South Florida Movers. Hialeah Gardens is a city of 20,000 that was incorporated in 1948. It served as a horse racing hub from its inception until the late 60s when zoning laws were changed to generate population growth. The access of the city to many major highways has led it to become one of the fastest growing cities in Florida. Single story housing makes up the majority of the residences in the city. The city is also famous for its high percentage of Spanish speakers. 96% of the city speaks Spanish in their home which is the highest rate in the entire nation and edges out their neighbors. This Spanish population is mainly Cuban with Nicaraguan and Colombian the next most common. Discount South Florida and Hialeah Gardens movers provide low rates on residential, commercial, piano and long distance moving.